This article appeared in the Manchester newspaper the Evening Chronicle of 7 November 1899, illustrated by the drawings reproduced below. Among the witty asides and oft-repeated anecdotes are some nuggets of information for the researcher. We have provided the reference notes below. 1. Bullock's Smithy: an old name (already obsolete in 1899) for the village of Hazel Grove, nine miles from Manchester on the road to London. A satirical comment on the choice of sculptor for Gladstone (below). 2. William Ewart Gladstone, four times Prime Minister, died in 1898. The bronze memorial statue which still stands in Albert Square, Manchester was commissioned from London-based sculptor Mario Raggi and unveiled in 1901. 3. In 1899 Joseph Chamberlain was Secretary of State for the Colonies, and Paul Kruger was the President of the South African Republic; failure to respect each others' ultimatums led to the Second Boer War which broke out in October 1899 just before as this piece was written. 5. The Royal Jubilee Exhibition, Summer 1887. It featured 'Old Manchester and Salford' an open-air exhibit of replicas of old buildings from the two cities. Cassidy worked in one of these, modelling clay heads of visitors. 8. 'Hair Restorer; cures for baldness were much-advertised in the Victorian era. 9. Prince George, 2nd Duke of Cambridge (1819–1904), son of the seventh son of King George III. He died without legitimate issue. The title was revived in 2011 for Prince William on his marriage. 10. Herbert Vaughan (1832 - 1903) Roman Catholic Bishop of Salford 1872 - 1892, Archbishop of Westminster from 1892, made a Cardinal in 1893. 11. Links in these paragraphs are to our features on the works mentioned. 12. Samuel Ogden (1819 - 1903) textile manufacturer, prominent member of the Manchester Athenaeum, a gentleman's club whose headquarters, built in 1837, The club folded in 1938, and the building now forms an extension to the adjacent City Art Gallery; the current whereabouts of the bust are unknown. 13. Longford Hall was the home of Mrs Rylands, founder of the John Rylands Library and patron of Cassidy. 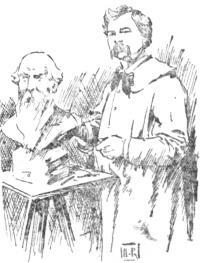 A bust and a statuette of Sir Charles Hallé, founder of the Hallé Orchestra, are known. 14. 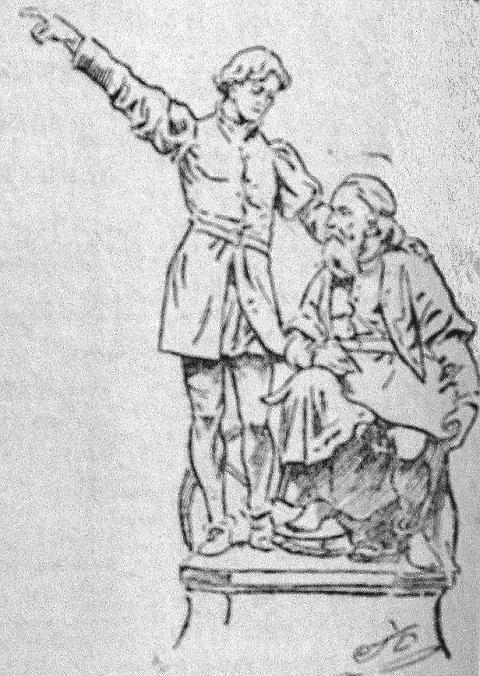 John Cabot, explorer said to have landed on the American continent, and his son Sebastian. The work was first shown at the New Gallery, London, in 1896. Photographs of plaster models, exist, but we have yet to discover any trace of a full-size bronze version. Special thanks to the Manchester Academy of Fine arts for allowing access to the original in their Archives. AN HOUR WITH A SCULPTOR. THINGS SEEN IN A STUDIO. Sculptors, like poets, are born, not made, and Nature, knowing how we appreciate the rare, doesn't allow too many sculptors to come into this world and go about on the sculp, so to speak. And sculptors, like prophets, are not always honoured in their own country. Curious, isn't it, that if there is a statue wanted in Manchester the highly estimable gentleman who may have the matter in hand would rather go to London and spend a few hard days and a few jolly nights looking for a sculptor, than they would walk up to the Lincoln Grove studio and order the article the local emporium. But all laws have, more or less, their compensations, and other good people make long journeys to Manchester just to get an artistic statue. However, I suppose if there is nothing else for it, removing far from the boundary of the Manchester rate collectors, to secure the esteem of certain trustees, Mr. Cassidy will transfer his studio to the sylvan remoteness of Bullock's Smithy.1 Then, possibly, those wanting a marble figure of Gladstone2, Chamberlain, or Kruger3 for Albert-square will take a special train and spend a quiet afternoon with Mr. John Cassidy. You all know Mr. Cassidy. The man who has put more people on a bust that one cares to record. He has even furnished busts for ladies and been most charmingly complimented on his beautiful work. I've called it work, but it isn't really anything of the kind, it's enjoyment, pure unadulterated pleasure, for the simple reason that it is Art. If you were to see Mr. Cassidy making a clay model of a handsome client, and could watch him fashioning with cunning fingers the pliable material until the portrait is complete, you would say, "It's wonderful!" And it is! Of course, to a man who possesses the critical faculty, and who knows, as Shakespeare said, "What's what!" the talent of Mr. Cassidy is great, but it has its limitations. Let me explain. I saw him just finishing a fine marble bust of Mr. Scott, of Burnley4. I'll admit the chiselling was exquisitely done, the portrait correct, the expression admirable, in fact, the most cultured critics would not be able to detect a flaw or find a fault. But to me there was one thing lacking. Perhaps Mr. Cassidy noted that disappointment was feeding on the damask curtains, for he enquired most anxiously if I cared for the bust. "Oh, yes," I replied. "I like it immensely, but it is short of one thing to make it what you might call a speaking likeness!" "What is that?" eagerly asked the sculptor. Then we moved on to the next department. On the occasion when the Duke of Cambridge9 graced the Old Trafford grounds, he went along to the Old Manchester quarter, and of course, seeing Mr. Cassidy engaged in modelling, entered the studio. Perhaps he was unaware how Mr. Cassidy spells his name, for he opened the conversation in Italian to the consternation of the artist. However, he replied in pure Manchester English, and Royal Duke and debonnair artist were soon on happy terms. Mr. Cassidy has wondered since whether, if he had put an "i" at the end of his name instead of a "y" he would have seen more favour. Well, two eyes are better than one as a rule. At the same exhibition, during the forenoon of one day when trippers mostly did not congregate, Mr. Cassidy was busily engaged in "working up" his clay previous to commencing modelling. It is not a very interesting process, but it is necessary. While thus employed crowds were passing, and one man, evidently from Oldham, looked in the studio. He soon left, and his friends, desiring information, said, "What's going on, Jack?" "Oh, nobbut a chap makin' bricks!" In connection with that famous and not-to-be-forgotten Exhibition Mr. Cassidy says that the enthusiasm which his modelling raised among the spectators resulted in some two hundred people giving orders for busts, but when the time came for sitting no fewer that 195 never turned up to pose on the throne and see themselves in clay as others see them in the flesh. Of course many orders for busts are given by wives, who promise to send their husbands along at a stated time, and Mr. Cassidy says it is strange what an amount of ignorance there in connection with these plastic presentiments. Many believe that a plaster cast is taken of the features, as the Italians used to do in days gone by, and one gentleman who had come to sit to please his wife was in such a nervous state during the preliminaries that Mr. Cassidy could not help wondering what was the matter. However, as the modelling went on, and the portrait began to assume perfection, the sitter became cheerful and chatty, and at the end admitted that he was in fear and trembling at the start due to the casting idea. Another work, however, which perhaps may be classed as Mr. Cassidy's finest effort is the bronze group of the Cabots, father and son. 14 Magnificently conceived and beautifully carried out, it stands, today, a monumental testimony to the sculptor's genius. Transcribed and edited by Charlie Hulme, September 2011.